Jan. 23, 2014 9:00 a.m. 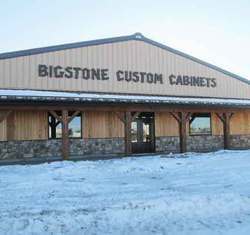 Situated on the south side of Millet at 4905-45th ave just off highway 2A, Bigstone Custom Cabinets will be opening their doors for business February 3. Established in 1990 the business employing approximately 20 is a welcome addition to the Millet business community. When asked why they picked Millet to build their new shop owners Gerald and Tracy Finnman are quick to list the virtues of their new location. “Economics for one, the land and tax prices here are much more reasonable than in bigger municipalities, most of our market is in this area and north which also makes it a good location along with the easy accessibility from the highway and visibility, Gerald explains adding that he feels it’s a ground floor investment in the future growth of Millet. The attractive new building boasts a 13,000 square foot shop. One piece of technology, a Barbaric Sorter, is the first one running in Canada. This new technology in the wood working industry sorts and picks up all the wood needed for a project after having the sizes and amounts programmed in. Bigstone uses environmentally friendly water based finishes on all their products. They also use their wood scraps for heating with the hopes that will be able to achieve 50% of their heating from this source. The show room won’t be finished right away but you’re encouraged to check out Bigstone Custom Cabinets website and Facebook page, where you can see the endless possibilities. Besides cabinets they also supply laminate, granite, quartz and other stone counter tops. Bigstone can also help you design custom mantles, entertainment units, murphy beds and furniture. As well as options for storage in your kitchen, mudroom or laundry room. The options are as limitless as your imagination. The official Grand Opening is tenitively scheduled for June 21st so the showroom will be fully set up to showcase product and design options for the public.